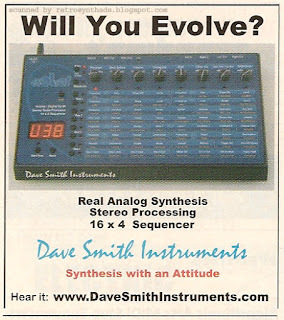 Dave Smith Instruments Evolver "Will You Evolve?" colour advertisement on page 128 from the September 2002 issue of Keyboard magazine. So recently, I happened to be doing some historical research for a totally different synthesizer company and came across some of Dave Smith Instruments early synth ads. I decided to file them away in the back of my mind (and my excel spreadsheet) to blog about later. Probably when the ads had aged another five years or so. Then, just today (I'm writing this on April 4), Dave Smith Instruments announced on their Facebook page that this year marks it's 15th anniversary. As part of the celebrations, they are asking users to send in a photo of their first DSI instrument along with a short story. Now, I have a great DSI Evolver story, but I'm saving that ditty to send in to them to hopefully win some sweet DSI swag. Anyways, now throw those two coincidences in with my recent and totally unrelated Sequential Circuits Prophet-15 April Fools Day post and it's looking like Fate is punching me in the face. And so here we have it. 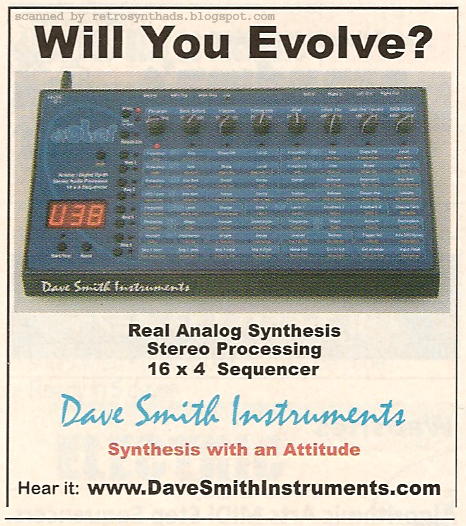 Dave Smith's FIRST advertisement in Keyboard Magazine under the DSI banner. What a humble new beginning for such a synth giant. It's a small advertisement - that's for sure - measuring in at only 2.5" x 2.25". Understandably it doesn't have the room to say a lot about the Evolver. The Evolver does a lot more, but the bullet points provide a good insight into what DSI probably thought would differentiate itself from other gear at the time and/or what users in 2002 would probably gravitate to. And that tagline - "Synthesis with attitude" is perfect. The Evolver has *tons* of attitude. But to me, the most interesting thing about this ad was its location in Keyboard. 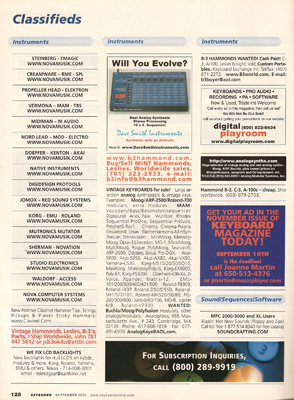 Unlike many of the Sequential Circuits advertisements that came before it, the Evolver wasn't being introduced to readers through a large two-page centrefold spread. This little guy was tucked into the classifieds section of Keyboard (see right). It's clear that precious marketing dollars weren't being spent on advertising in these early early days. And, it was probably the right move since from a PR perspective, his name alone would have opened a lot of doors and created some good exposure through earned media. Better to spend those dollars elsewhere like trade shows. In fact, if I recall correctly, it wasn't these early ads that led me purchase an Evolver so early on. It was word of mouth as news of Dave Smith's return slowly spread across the Web. Yup - his name sold me on that synth. Sure, it was also the features of the Evolver, but back in 2002 it felt like a big risk for me to buy a synth off a Web site from another country. His name sealed that deal. Grass roots all the way!